Gas grills are the most convenient option for the avid barbecue fan. They heat up quickly, which means your meal will be ready faster, with a minimum of fiddling. The larger the grill, the more burners it will have, and some gas grills have side burners as well so you can heat up sauces or fix a side dish while your food cooks. Most have split cooking areas, a direct cooking area over the fire and a secondary cooking or warming area above that. Gas grills are the most popular type because of their convenience, but if you prefer to cook over charcoal or are thinking of investing in a smoker, see our separate discussion of charcoal grills. If you need to cook on-the-go, head over to our discussion of portable grills. For this update, we're going to make the Weber Spirit II E-310 (Est. $500) our Best Reviewed pick. It's a brand new grill in the Weber Spirit line, replacing last year's Best Reviewed grill, the Weber Spirit E-310 (Est. $500), which is still widely available and is also a great grill in its own right, so there's no reason not to buy that one while it's still around -- especially if you can find it on sale. There isn't a lot of feedback on the Weber Spirit II E-310 as of yet, but the early buzz looks promising and you simply can't do better than a Weber grill. Sure, they're more expensive than some comparable grills, but they also come with the performance and durability that has made Weber such an iconic name in grills. They're practically grills for a lifetime, not just a few seasons; we've seen comments from owners who have had a Weber gas grill since the 90s and say it's still going strong -- they upgraded merely to take advantage of improvements in technology. And it helps that Weber offers replacement parts for all of their grills, even older models. The only extensive testing we spotted for the Spirit II E-310 is at AmazingRibs.com, but Max Good is highly complimentary, even including it in his 2018 "Best Value Gas Grills" roundup. He praises its even heating, easy clean up and reversible cooking grates that add to the grill's versatility: one side is thinner for more delicate foods such as fish, the other is flat for creating sear marks on meat. This "flipability," while not unique to Weber, is a popular feature. In testing, Good found that the Spirit II E-310 did a good job on burgers, flank steak, veggies and a whole chicken. He's also impressed by the "flawless ignition performance" of the improved ignition system. He ultimately acknowledges that Weber grills tend to be on the pricier side, but says, "Many cheapo gassers only last three to four years while Spirits can keep grilling for decades." Consumer Reports tests the Spirit II E-310 as well, giving it Very Good scores for evenness, indirect cooking and convenience; Good for preheat performance and temperature range; and Excellent for sturdiness. It does not earn a Recommended nod, but, to be fair, very few grills there do. Although there are few owner reviews for the Weber Spirit II E-310, most new owner are complimentary. We had to be a bit careful in weeding through the available reviews, too. At Amazon (where it has 4 stars in 21 reviews), there are a few very low ratings from non-verified purchasers -- verified purchaser give the grill high ratings overall. And at Home Depot (where it gets higher ratings, but spread out among several color options) some of the reviews are culled from the manufacturer's website; others are part of the "Seeds Program" which offers free products in exchange for review. While Home Depot notes that, "The Home Depot does not influence the opinions of Seeds Members, nor do we modify or edit their reviews," in our experience, reviewers tend to be more positive about free products. Still, with all of that taken into account, early owner feedback from verified buyers is very positive for the Spirit II E-310, with praise for its performance, sturdy build and attractive appearance. Most say this latest Weber lives up to its manufacturer's reputation. The few lower ratings we saw seemed to be primarily related to damage in shipping -- which is certainly not the grill's fault. The only consistent, non-shipping-related complaint we saw was that the Spirit II E-310 is kind of hard to move around, you have to figure out the "trick" to getting it properly balanced on the wheels. The Weber Spirit II E-310 is a three-burner, mid-sized grill with a total cooking area of 529 square inches (424 primary, 105 warming rack). This model does away with the enclosed cabinet that the former E-310 had in favor of an open design with a shelf and the tank moved to the side of the grill, with hooks for tools. While Good speculates that it was a cost-cutting move, it also makes the propane tank easier to access. However, if you like that closed-cabinet design, buy the previous-generation E-310 -- at least while supplies last. The Spirit II E-310 also comes in a nice selection of colors: black, ivory, red and sapphire. A natural gas version is available as the Weber Spirit II S-310 (Est. $500). A smaller version of the Spirit II E-310 is available, the two-burner Weber Spirit II E-210 (Est. $400). Its total cooking area is 450 square inches (360 primary, 90 warming), and it can be expected to perform as well as the E-310. If you need a larger grill instead, we recommend the Weber Genesis II E-310 (Est. $700). Its total cooking area is 669 square inches (513 primary, 156 warming). The Genesis II E-310 is the upgrade pick at Wirecutter, which praises its "consistent edge-to-edge" heating. However, this grill was an upgrade based upon its comparison to the original Spirit E-310; those difference are no longer relevant as the Spirit II's design is now the same as the Genesis II's design, with an open chassis and shelf with a side-access propane tank. The only difference in styling we see is that the Genesis' warming grate folds up and out of the way. Still, if you need a larger grill and want the near-lifetime durability of a Weber, buy the Genesis II. As with the Spirit II E-310, Consumer Reports does not offer a recommendation for the Genesis II E-310 (however, of the 164 small, medium and large grills they test, they recommend only 14), but it earns Excellent scores for indirect cooking and sturdiness; Very Good for evenness, and convenience; and Good for preheat performance and temperature range. Owners like the Genesis II very much, though, with a 4.4 star rating at Amazon and owners praising it's great performance and ease of use. They do say that it's hard to assemble, though, so be sure to be prepared to be patient, and maybe have a friend there to help (or pay to have it done). The Genesis II E-310 comes in black, stainless and a mocha version (Est. $700) that's exclusive to Lowe's. In-lid temperature gauges aren't generally accurate, so don't count on them to estimate your cooking time. Rather, buy a tested-for-accuracy meat thermometer (which we cover in their own report) to be sure your meat or poultry is actually fully cooked -- or undercooked if you like a rare steak. As for the iGrill 3 compatibility, experts agree that it needs work. While it can track up to four food temperatures at once, you need to buy the probes and the iGrill Thermometer (Est. $90, including two probes). But what bugs expert reviewers about the iGrill is that you can only track temperature readings on your smart device -- even if you're standing in front of the grill. Still, it might be convenient for those who toss meat on the grill and then leave to do other tasks, or to visit with guests. Also, while experts aren't impressed, owners generally like it a lot, with most saying it's very accurate and super convenient. Of course, there are complaints of finicky and dropped connections. iGrill is only compatible with Weber grills, those who think they can use it with any grill are definitely disappointed. The Genesis II line has a wide variety of grill in various sizes and configurations, which we won't list here; we suggest you visit Weber's Genesis II page if you want to learn more about what's available. Consumer Reports recommends a couple of Weber Genesis II grills, the propane gas-powered Weber Genesis II LX E-340 (Est. $1,200) and the natural gas version, the Weber Genesis II LX S-340 (Est. $1,300) in their mid-sized grill category, and, in the large grill category, the Weber Genesis II LX E-440 (Est. $1,500), and its natural gas counterpart, the Weber Genesis II LX S-440 (Est. $1,600). The LX line is a luxury upgrade, with more features -- but also a much higher price. According to most experts, these pricier grills don't perform any better than the less-expensive Genesis II line, so we don't explicitly recommend them, but if you can afford the upgrade, we say go for it. One other grill that's recommended by Consumer Reports and also earns promising -- but very limited -- owner feedback is the Permasteel 6 Burner Entertaining Grill (Est. $650), a Lowe's exclusive. After testing, Consumer Reports editors give it scores of Excellent for preheat performance and sturdiness, Very Good for evenness, indirect cooking and convenience, and Good for temperature range. While Consumer Reports includes it in their mid-sized grill category, we consider a six-burner grill to fall firmly into the large grill camp. Its total cooking capacity is 736 square inches (544 primary and 192 warming). 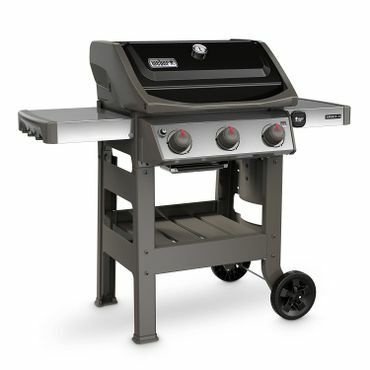 This attractive, stainless steel grill is absolutely loaded with features for the price: a side burner; stainless steel cooking grates; individual electronic ignitions for each burner; foldable side shelves; and a temperature gauge (although this type of temperature gauge is notoriously inaccurate. Again, see our separate report on meat thermometers for some choices that will actually give you an accurate reading.). The front of the Permasteel is very sleek, with four cabinets, one of which hides the propane tank (which also slides out for convenient access), one that holds a pull-out trash can, and plenty of extra storage in the rest. It's more like an outdoor kitchen than a mere grill. So what keeps this marvel out of our top spot? In a word: feedback. Only Consumer Reports tests it and, as noted above, there are only a few owner reviews at Lowe's. They do give the Permasteel 6 Burner Entertaining Grill 4.5 stars, but there's simply not enough user feedback to garner a well-rounded picture of this grill -- especially its long term durability. Still, those who do post there praise the grill's appearance and particularly love the ability to light the burners individually. If your budget simply won't stretch to a $500-plus grill, the four-burner Nexgrill 720-0830H (Est. $270) should be high on your list. With 644 square inches of total cooking space, it's got the capacity for a big family or a small crowd. Consumer Reports gives it both a Recommended nod and a Best Buy designation. In testing there, the Nexgrill earns ratings of Excellent for evenness and preheat performance, Very Good for temperature range and indirect cooking. At Good Housekeeping, it's one of their top-rated grills too, earning 4 stars out of 5. Editors there praise its "gleaming stainless steel appearance," as well as its ease of use and great heating and cooking performance, with minimal smoke and flare-ups. The only con they note is that you have to monitor larger foods, like chicken, to be sure it doesn't char on the outside before it's fully cooked on the inside. Owners are very complimentary as well. At Home Depot, which is the exclusive retailer for the Nexgrill 720-0830H, it earns a 4.3-star rating in nearly two hundred reviews. Most are extremely pleased with both the performance and features. They say it heats quickly and evenly, and love how easy it is to light. The side burner is popular with cooks who like to warm sauce on their grill for brushing on the food they're cooking -- and with those who have to deal with occasional power outages. The only real complaints we saw about the Nexgrill 720-0830H from owners is that assembly can be a challenge, there are a lot of parts. However, once assembled, they note that the stainless steel grill makes it seem more high-end than it is, although a few say the metal seems flimsy. If you don't need that kind of capacity, take a look at the smaller Char-Broil Classic 405 (Est. $135). It's not included in any professional roundups, but it gets very good ratings at retail sites, including 4.6 stars at Amazon in more than 50 reviews. And Char-Broil Classic models generally score well with experts, who like that line's sturdy build and even heating. The four-burner Char-Broil Classic 405 has 405 square inches of total cooking space and the 190 square-inch warming rack swings away for more flexibility. Otherwise, it's a pretty basic grill, but that's what most buyers say they were looking for and they're not disappointed. They call out its easy assembly and great performance in grilling. Most also say it seems very sturdy.